Two (2) Fully Backward Compatible, (1394a–2000 Fully Compliant) Bilingual P1394b Cable Ports operating at 100/200/400/800 Mbits/sec. One (1) 1394b optical port with LC type connector. Full Duplex Data Rate at 100/200/400/800 Mbps. Multi-Mode-Fiber (MMF) Glass optical fiber cable support. Maximum link length 550 meters. Operating System support: Windows/Mac OS X/Linux. Metallic enclosure for demanding industrial environment. 2 x GOF Optical Repeaters. 2 x 12 VDC power supplies. 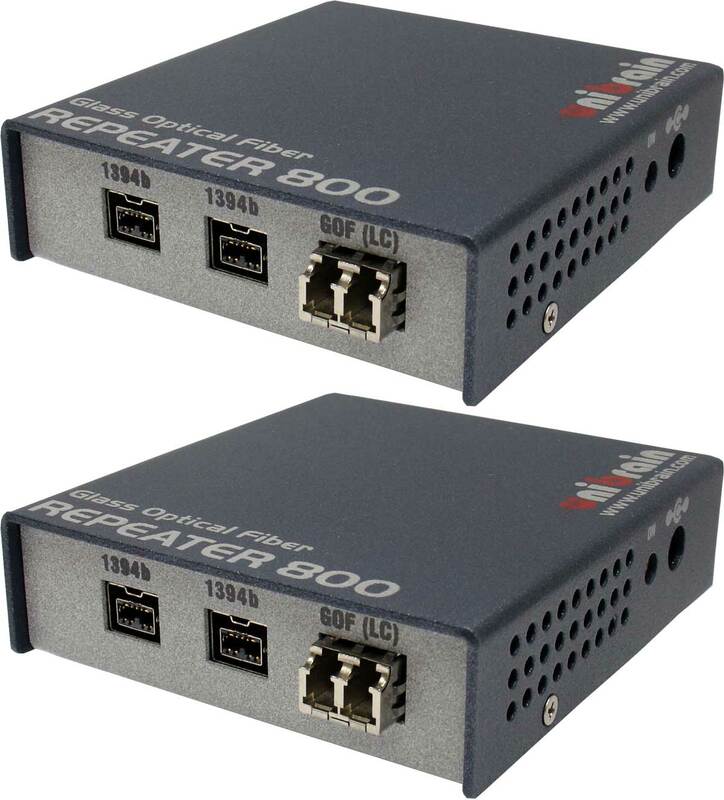 The new 1394b five (5) port repeater from Unibrain is oriented towards professional and machine vision applications. FireRepeater-800 Pro™ provides the ability to connect up to five firewire 1394b devices and its metallic compact case minimizes the risk of physical damage. add a connection point into an existing link. 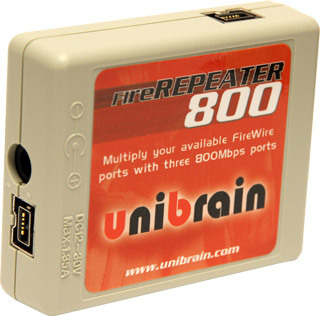 extend FireWire Cable lengths (tested up to 110 meters or 360 feet). 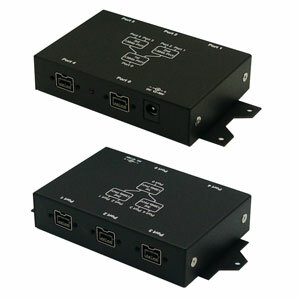 add or reinforce DC Power Supply capability of your FireWire connection using the optional 12V DC power adapter can be used.